We can eat healthily at home but when we go out, we don’t want to think about how much butter might be in the dish or how much cheese. We just want to enjoy. Going out to eat can be a good excuse to just let go and be a bit decadent. After all, who wants bland food when they go out to eat? So, wouldn’t it be nice to be able to go out to eat for a delicious, flavorful, filling meal that happens to be health-conscious at the same time? When you think about health-conscious eating, California is probably the state that comes to mind. With the stereotypes and fads that people like to jump on here, this is a normal conclusion. But, I not talking about the newest raw-food, vegan, juice bar. 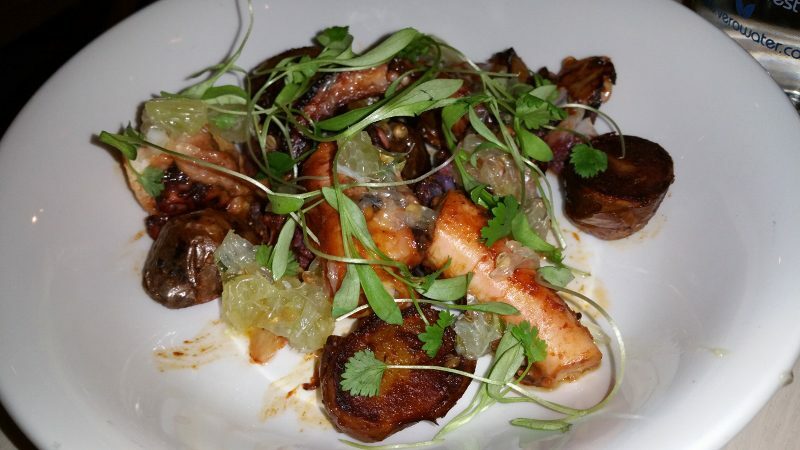 I am talking about the new health-conscious restaurant in New York – Cafe Clover. Featuring an American cuisine, there was not a single thing that didn’t look good on the menu. 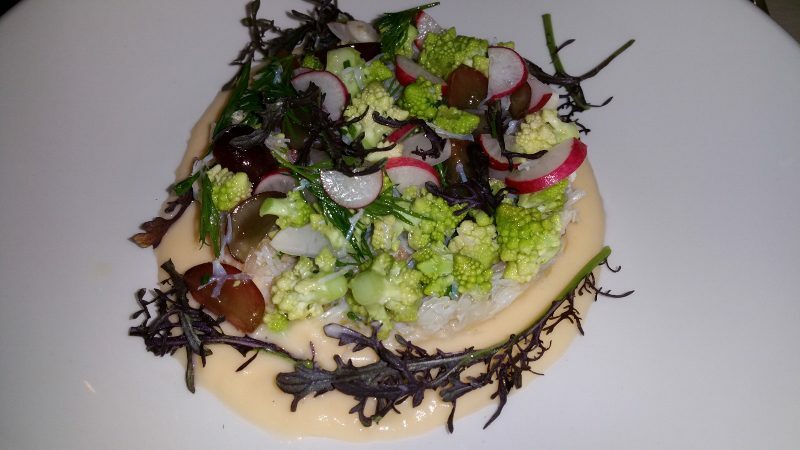 The menu is diverse and creative but it’s also healthy. 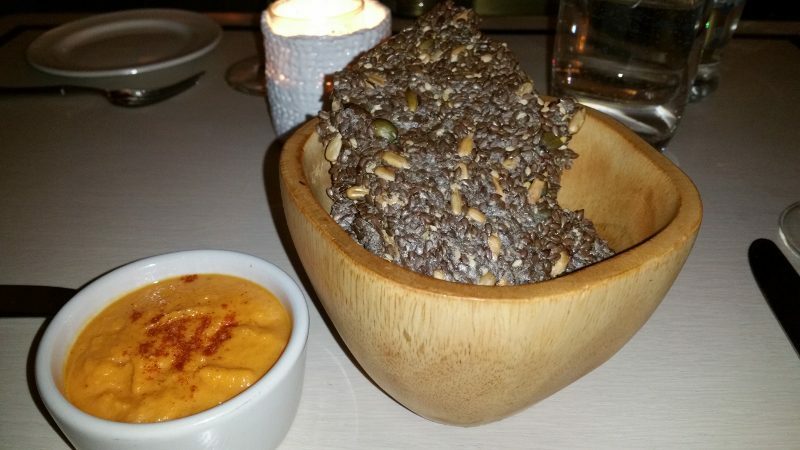 As my friend and I looked at the menu and tried to decide what to order (or rather what items we had to leave out of the order due to our eyes being bigger than our stomachs), instead of a basket of bread, we were served chips made from flax, chia, sunflower and pumpkin seeds and served with butternut squash hummus with berbere. We started at the top of the menu and proceeded to order from every section. We decided to load up on vegetables with two options from the Green Market Salads. 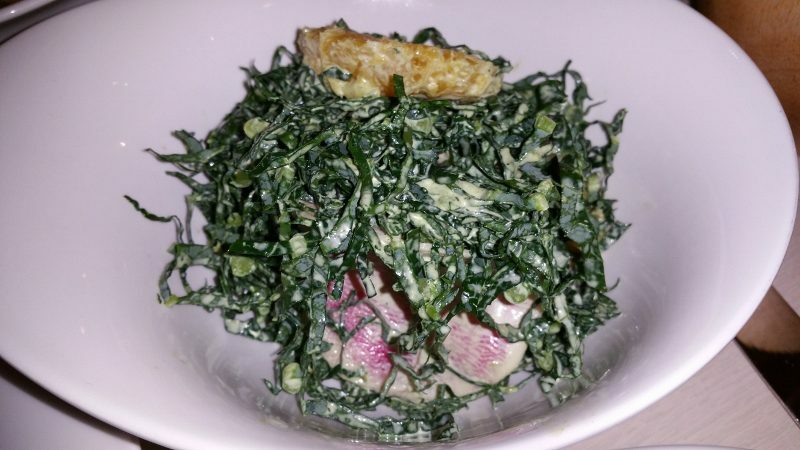 The Kale, Blood Orange and Watermelon Radish was bright with citrus notes that were balanced by a creamy dressing. 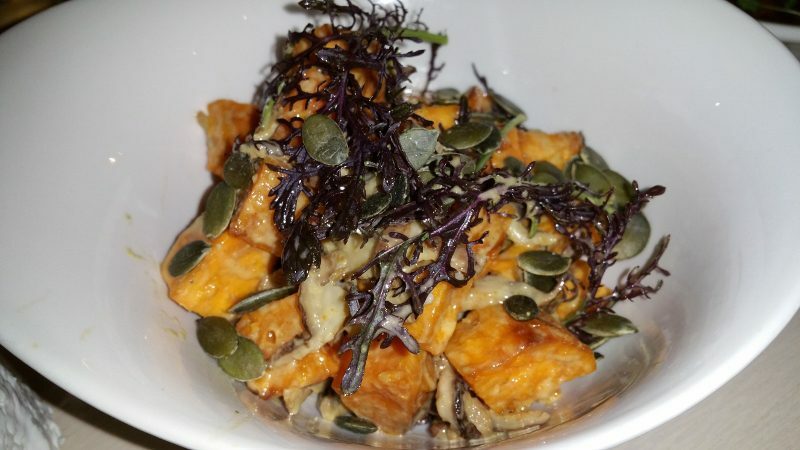 Loved the mix of sweet and earthy flavors of the Sweet Potatoes, Shitake, Pumpkin Seeds and the pumpkin seeds added extra texture as well. From the Starters section, we couldn’t make up our minds so we ordered the three that we were eyeing. 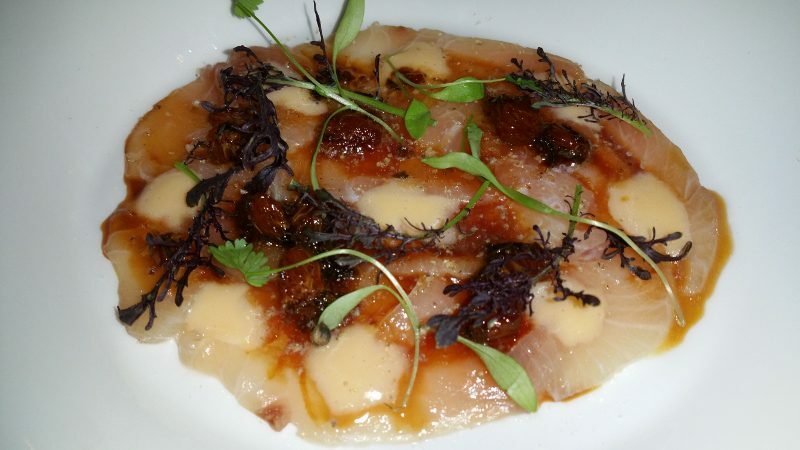 The umami flavors in the Shaved Hamachi with Sunchoke, Sweet Gem, Yuzu gave this delicate dish a richness and depth. We also had three items from the Entrees section. 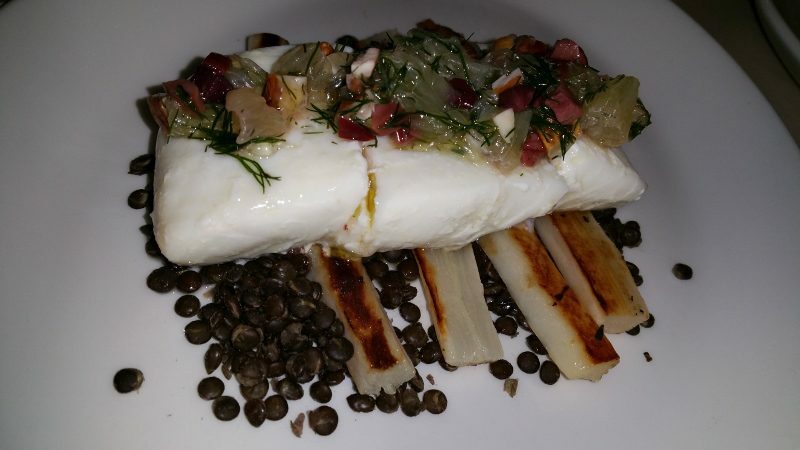 The Poached Halibut with Salsify, Black Lentils, Almonds, Olive and Lemon was a tender, buttery piece of fish. 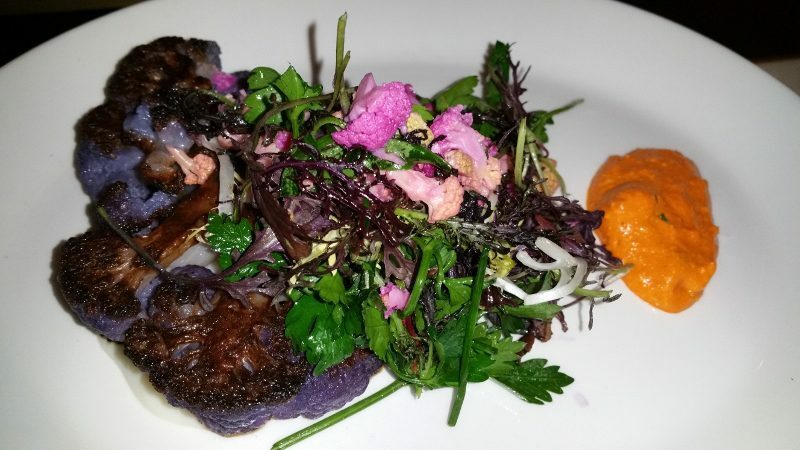 Aside from being a colorful dish, the Cauliflower Steak Romesco with Vegetable Chutney was thick and filling…..not bad for a meat-free, vegan dish. 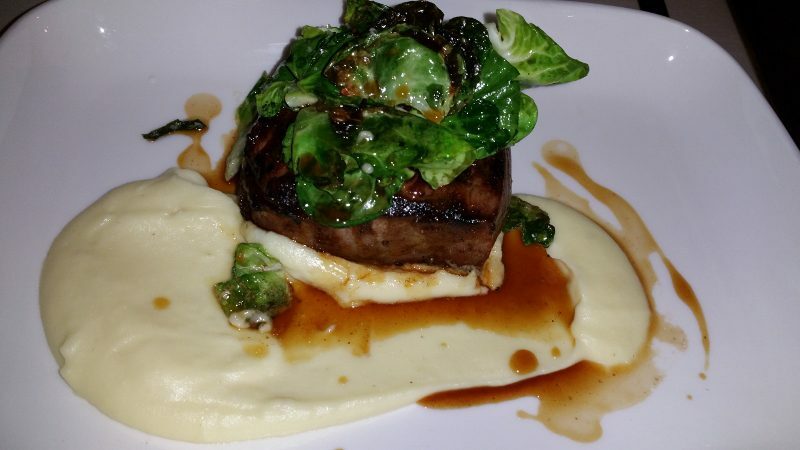 Green Valley Farm Beef Striploin with Brussels and Olive Oil Potatoe Puree is a perfect example of how a restaurant dish can be healthy. The potato purée is whipped with olive oil instead of butter so it is light and flavorful but not full of fat. For Desserts, although we were only two people, we managed to order three relatively guilt-free desserts as well. 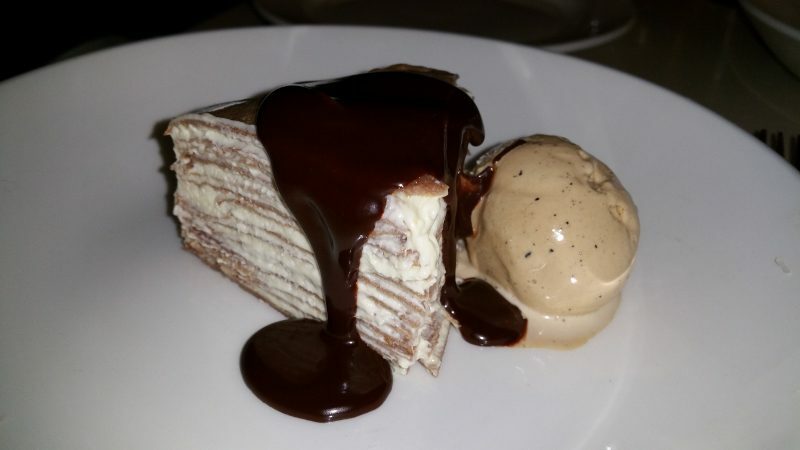 Teff Crepe Cake with Mascarpone Mousse and Espresso Chocolate Sauce – Teff is an ancient North African cereal grass and is full of nutrition. Here it is used to make crepes that are layered with mascarpone. The cake is dense but delicate. 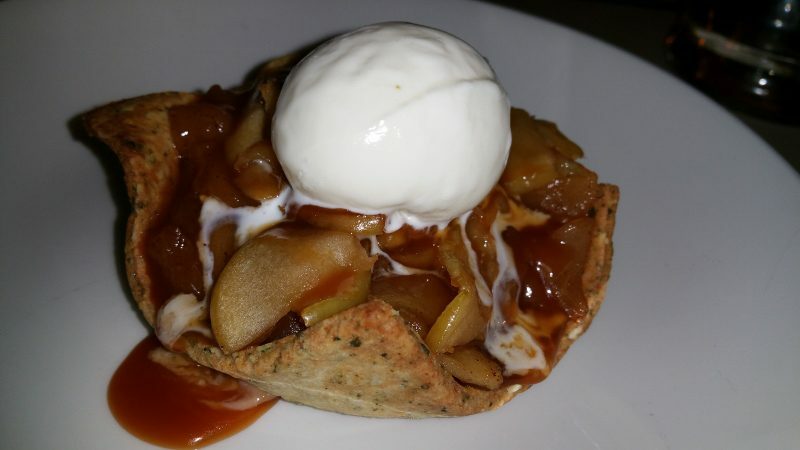 The Honey Crisp Apple Tart is a classic dessert but this one is made with Pumpkin Seed Crust and a Mascarpone Gelato. Healthy and gluten-free. 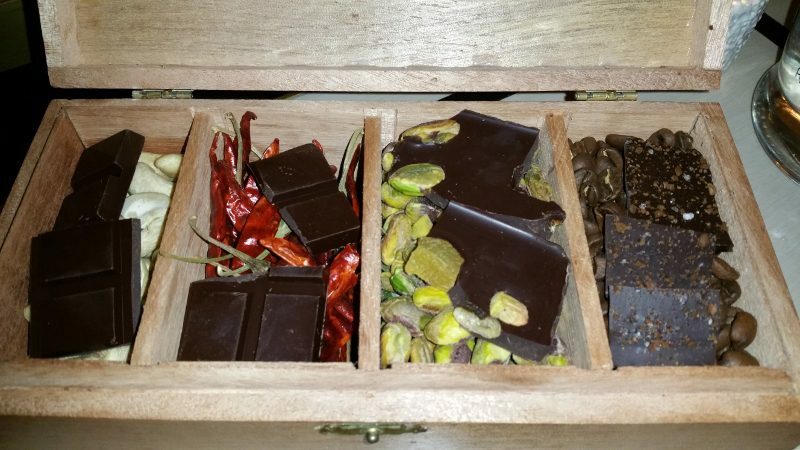 Dark Chocolate Selection from Cacao Prieto – A beautiful box is presented with four chocolate sections – dark chocolate, dark chocolate with chili, dark chocolate with pistachio and dark chocolate with espresso nibs. It is a perfect end to the meal. Despite how much we ordered, it is great to walk out of a restaurant feeling satiated but not guilty. Good food and healthy food can go hand-in-hand when you go out to eat. This entry was posted in Food, Lifestyle and tagged Cafe Clover, food, healthy, healthy eating, healthy food, New York, restaurant by Allison Levine.